A Little Inspiration – 2 | Support. Creativity. On the topic of creative spaces, this is the painting that hangs over my bed (and yes, those are mint green walls that you are seeing). About a year ago I came across the works of an Atlanta artist/sculptor named A.B. Lovell and immediately fell in love with his style. I tend to really enjoy abstract art because it can mean so many different things to so many different people. Anyways, I called him up and we talked to a while about creating a piece. I really wanted him to have fun with it, so there were really no boundaries other than size and me telling him my favorites in his gallery. I am truly inspired by his use of unique and found materials to create his art. When I walked into his studio to pick it up, I was amazed to find that my “painting” had to paint on it at all! 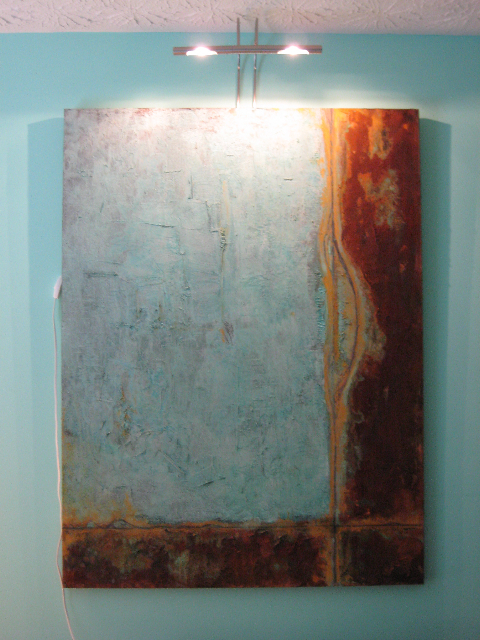 He used a hollow-core door as the canvas, the green/blue is an acrylic base with copper powder and the brown is actually tar with iron powder in it. He uses a technique with chemicals to Patina or age to metals much like an old coin or the statue of liberty. The result is an incredibly textured and unique piece of art that is totally original – he could do the same painting 100 times and never get the same result. Truly amazing and creative use of resources! Pretty Cool. I enjoy your artaucity.